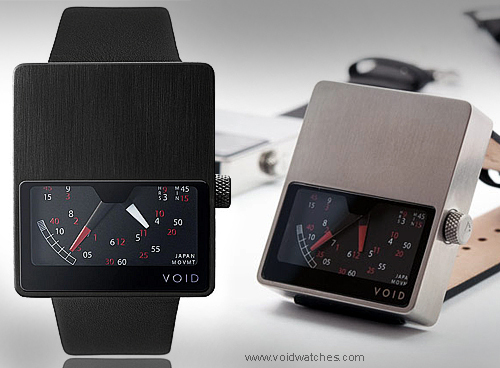 VOID Watches design draws heavily on the Scandinavian design tradition using simple geometries and traditional materials. The V02 is the analogue version of V01 watch using the exact same geometry but with a classic speedometer looking dial. It uses two ‘compass needle’ hands; each one has one red and one white end that correspond to the number with the matching colour on the dial. The stainless steel case comes in four different colours/surfaces: black, brushed, polished and gold. The movement is made in Japan. Does it live up to your expectations? Does it do what you want it to do? Do you like its looks? Which aspects of the product should be improved? Say first-hand what you think. Propose a product design for public evaluation. It's free and easy to do. No registration required. No personal data required. GravityLight. Generating light from gravity. Opel RAK e. Lightweight electric car. Occhio io 3d lamp series. Do you want to test a product before you launch it on the market? Do you want to know what engineers, designers and potential customers think, and receive tips to help you to improve your product? Are you the designer and would like to receive suggestions from users, manufacturers, engineers or other designers? Do you hold a patent or idea and seek help from designers, manufacturers or users and/or obtain technical, industrial or financial support to make your product a reality? If your product is not present on the Internet because it is in the design, development or testing phase, you can submit it here. It's free and easy to do. No registration required. The comments here are not monitored and belong only to the person who posted them. Designitives.com is not responsible for the accuracy of any information supplied by comment providers. We do, however, reserve the right to remove off-topic or offensive comments. SPD / Designitives is an initiative by Somerset Harris ©2018. All rights reserved. Powered by Blogger.